My first artificial earth satellite observations were made in 1960 during a time when computers were barely starting to evolve. 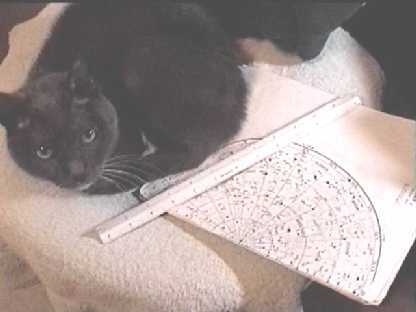 Satellite predictions were received by teletype from the Smithsonian Astrophysical Observatory and orbital elements were being produced with longitude crossing times for specific satellites. 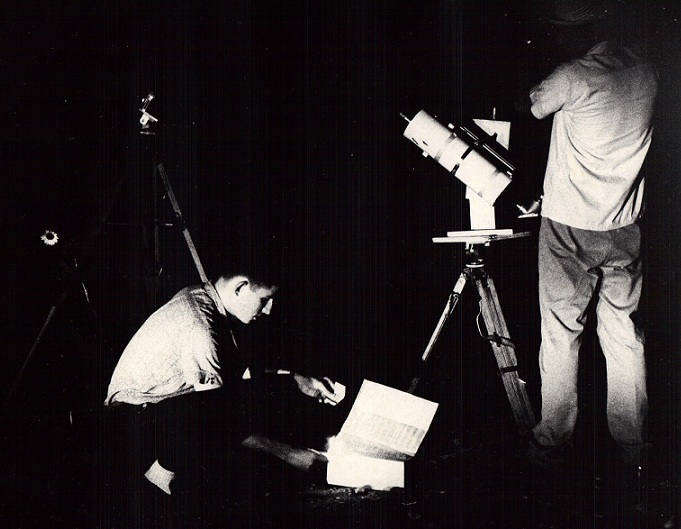 One had to manually use devices like slide rules and graphs to attempt to compute times of closest approach to a particular observing location. A collection of small telescopes I used to search for satellites. 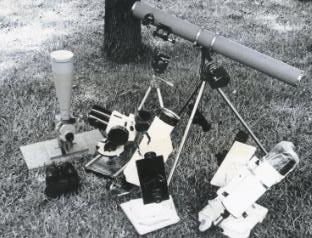 Between 1960 and 1965 I used a variety of small instruments including Moonwatch scopes 2-inch and 5-inch refractors, a small reflector and pairs of variable sized binoculars depending on the perceived range of the satellite. 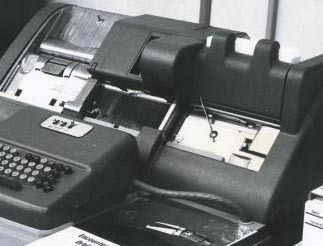 My first access to a computer (an IBM1620 at St. Mary’s University, San Antonio TX) came around 1964 where one had to use keypunch cards to feed into the computer in order to generate look angles. 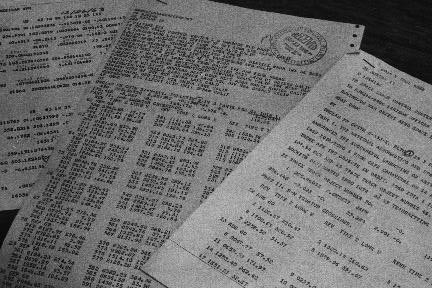 Examples of equator crossing prediction times and telex feeds from the Smithsonian Astrophysical Observatory. 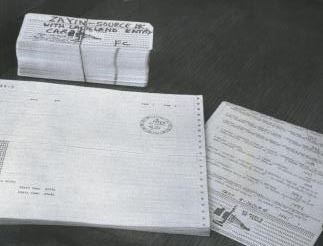 An IBM 1620 printer output stack and cards to be used with one of the computer programs. 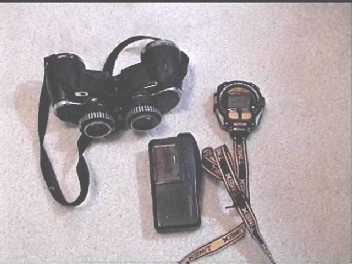 7×35 Tasco binoculars, a Radio Shack tape recorder and stopwatch all still in use today. 14-inch reflector I used to observe geostationary spacecraft. From 1969 to 2015 I lived in Houston where not only trees and houses blocked certain parts of the sky but also 21 treet lights could be seen. 150mm Fujinon binoculars are in foreground. 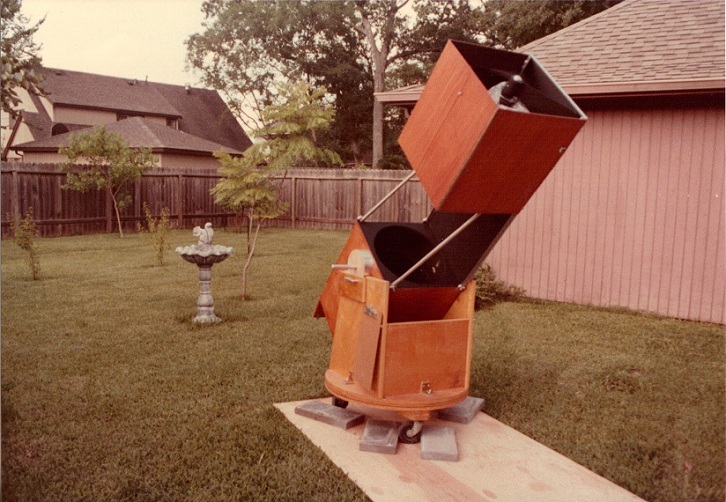 In order to get the best view of the sky at my former house located at 4535 Cedar Ridge Trail, Houston, Texas I had to erect cardboard shields and place the binocular mount at the edge of the driveway. 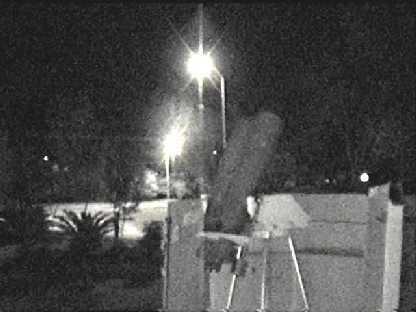 On one occasion a driver came around the corner at night at a high rate of speed, jumped the curbe and barely missed the equipment. 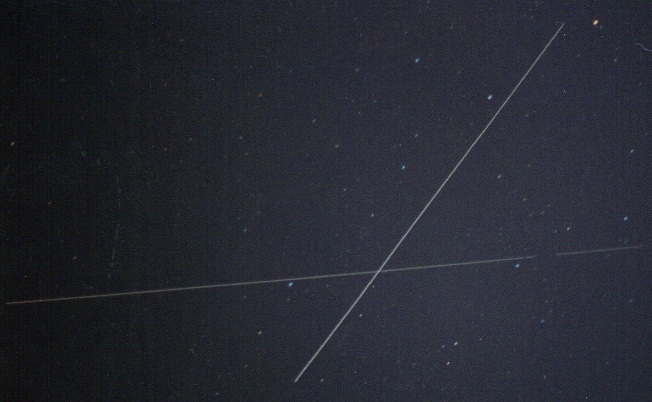 PAGEOS was one of my favorite satellites as it was a large reflective balloon remaining visible for quite a number of minutes on a pass. 1966 image. 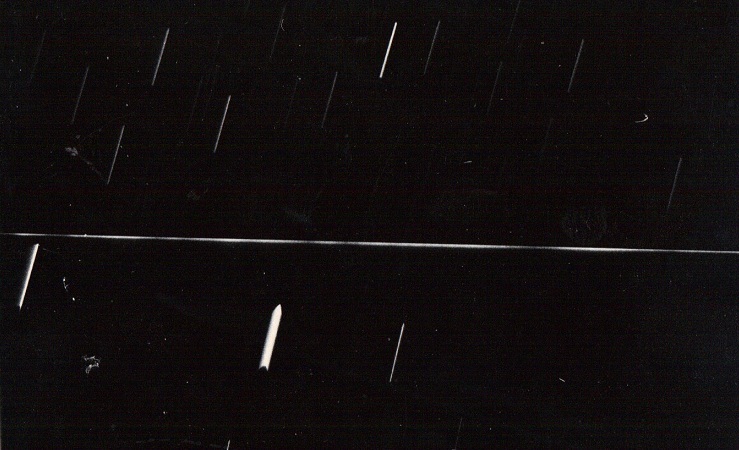 I flew to Kansas City in 1991 to photograph one of the final orbits of the Russian Salyut 7 space station. 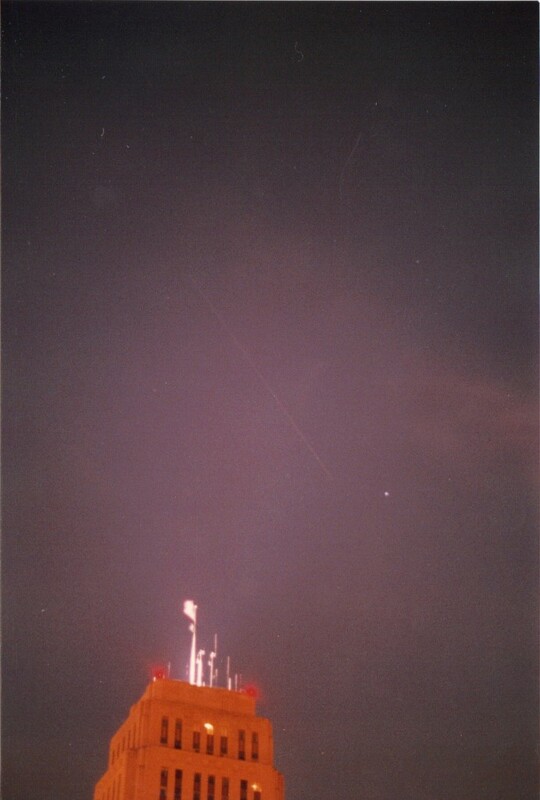 I photographed the STS-70 shuttle and Mir space station crossing orbits in 1995.